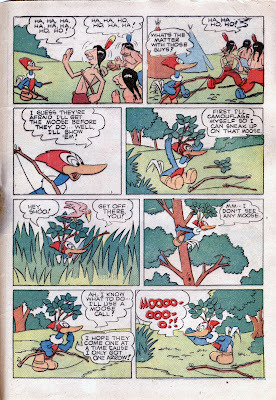 A defining moment in John Stanley's comics career, this debut of the regular "Woody Woodpecker" series in Dell's New Funnies allowed our hero to fully indulge his penchant for cognitive bias-driven anti-heroic characters. 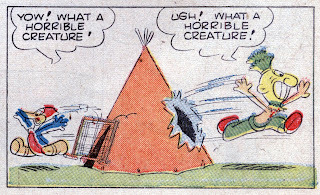 Hints of this character were present in Stanley's other comics work of 1943/4. Charlie Chicken in "Andy Panda," all the characters of "Tom and Jerry" and supporting figures in other stories all show signs of this essential Stanley persona. 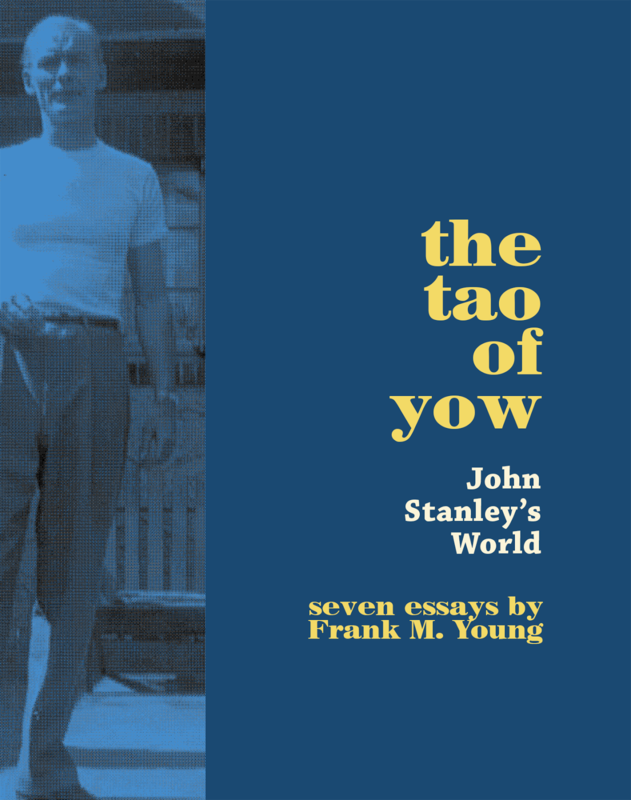 With Woody, Stanley could, for the first time, devote an entire story to such a protagonist, without putting him/her in the back seat, as the eternal aggravation of a "straight" logic-driven character. This story solved a problem for Dell. 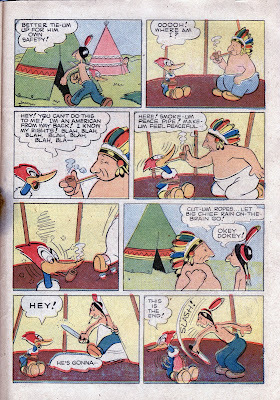 They had flirted with Woody's inclusion in New Funnies since 1942. The staccato-voiced sociopath was a big hit in Universal's Technicolor cartoons, produced by Walt Lantz. 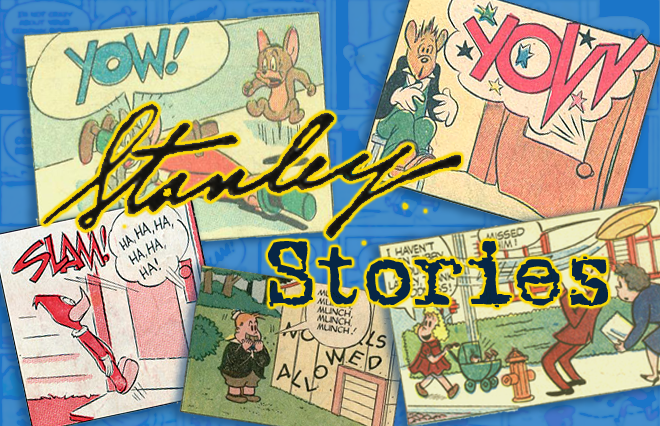 Woody appeared in strictly incidental roles, usually as a gadfly who upset the namby-pamby bunny fun of Oswald the Rabbit, in those dreary pre-Stanley issues of NF. 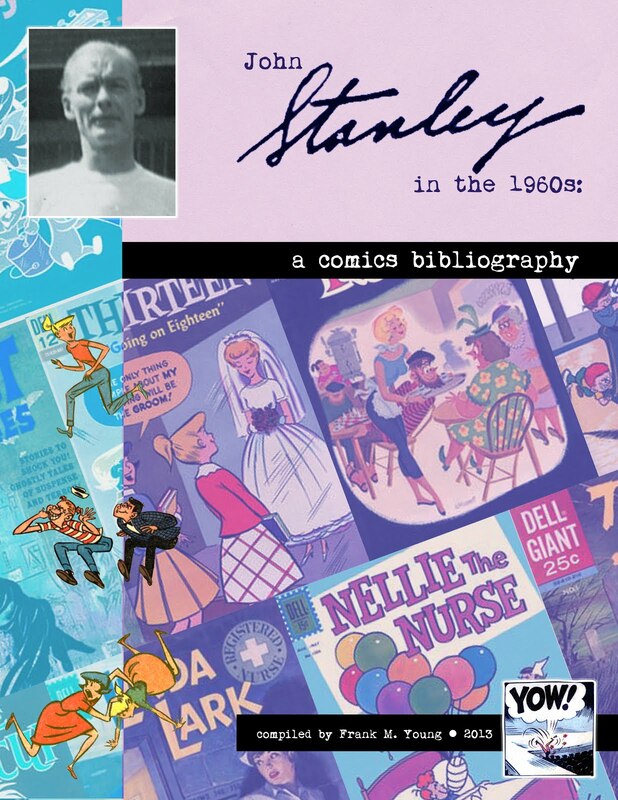 With Stanley's entrance to NF, Woody still remained in the background--consigned to walk-on parts in others' stories, or gag filler pages of little impact-slash-consequence. 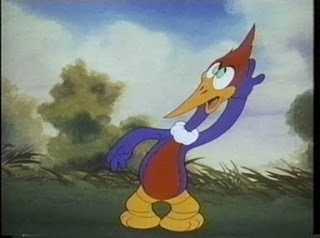 Meanwhile, Woody's on-screen exploits drastically improved, as director James "Shamus" Culhane migrated to the Lantz Studios and revamped the addled bird, with the considerable aid of designer Art Heinemann and animators Emery Hawkins and LaVern Harding, et al. Though blighted by a sub-par story department, Culhane's Lantz cartoons made the annoying cipher into a compelling, full-bodied lunatic--a force of nature destined to wreak havoc on whomever crossed his path. 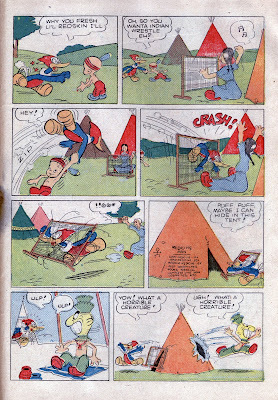 Today's story predates the first of Culhane's animated Woody cartoons, The Barber of Seville, by at least three months. The March, 1944 cover date of this comic book would mean it was on the stands around the end of 1943 or in January of '44. The story would have been conceived and produced a month or two before then--this is just a guesstimate--which would roughly place its creation in the fall of 1943. 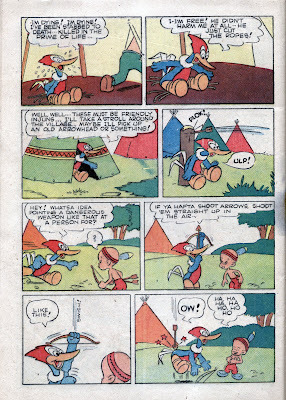 Woody's originally garish, unappealing look had been refined by Emery Hawkins in a couple of transitional cartoons, such as 1943's The Dizzy Acrobat and Ration Bored--the latter which Hawkins co-directed. 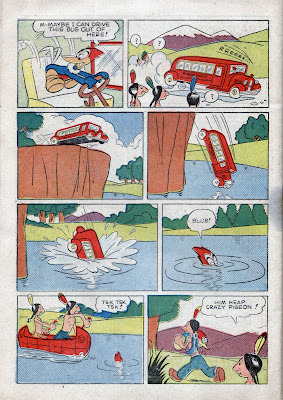 The cartoons were still shaky, uneven things in 1943. Thus, Stanley did another rescue-job on an insubstantial pop-culture icon. He gave Woody a distinguishable personality, as the ugliest of Ugly Americans, and presented him to the world in a story of intense absurdity and dark comedy. This preview panel should whet your appetite for this early John Stanley classic. PC WARNING: This story contains somewhat-stereotyped portrayals of Native Americans. 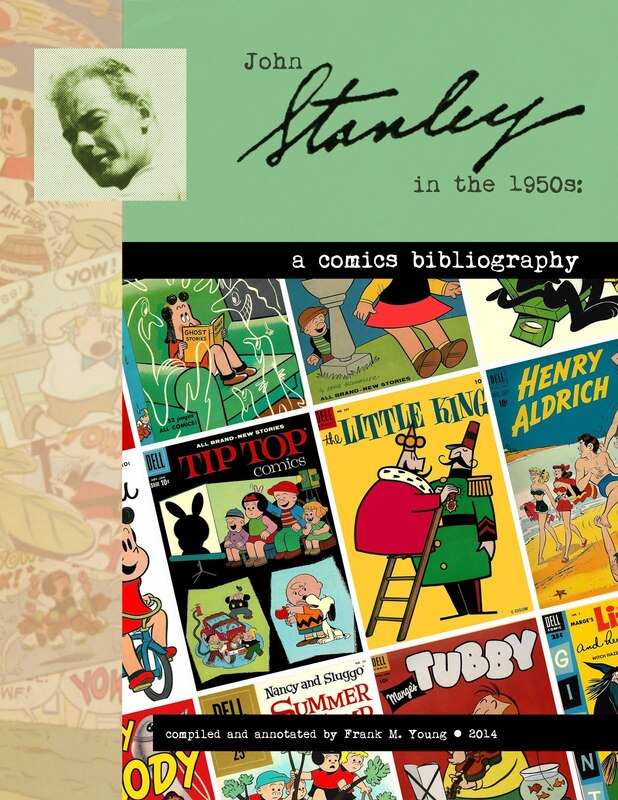 However, Stanley puts an edge on these tongue-in-cheek depictions, as you'll see when you read the story. I scanned this story from my copy of the comic, which has a curious quality I've not seen in old funny-books. It appears this copy got soaking wet, but somehow dried in a flat position. The pages are intact, and not brittle. They emit a fine, powdery substance (mold spores, I fear) and have a strange feel to them. The staples have auroras of rust staining around them. They show up on the pages but, blessedly, do not interfere with the comic book artwork. I may never remove this comic book from its protective bag again. It will probably be a pouch of varicolored dust in another 20 years. Like Stanley's finest anti-hero protagonist, Tubby Tompkins, Woody is utterly sure of himself. The vision of the world he sees is radically different from grounded reality. He is convinced that his is the right way, and that he is the master of all he sees and touches. 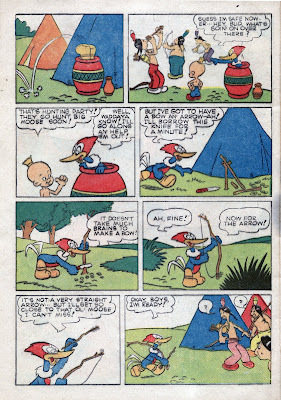 Woody's statement on p. 6, re the moose hunt--"I hope they only come one at a time, 'cause I only got one arrow"--is a perfect example of what I call "Tubby Talk" in Stanley's comics. It's the cocksure statement of a deeply flawed individual whose self-opinion is pure gold. 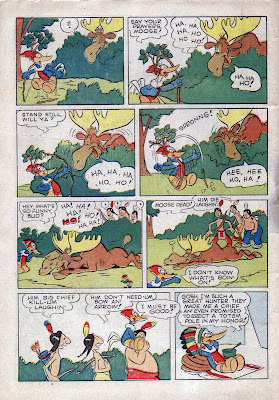 The denouement, in which the moose dies of laughter at the absurd sight of Woody the Injun warrior, is a beautiful moment--among the triumphs of Stanley's whole career as a comics writer. Ditto for the beautiful moment previewed today, in which the witch doctor and the bird find one another just as horrifying. There is something Carl Barksian about both these moments. But this is a level of humor that Barks would not achieve until the late 1940s, when he began to truly emerge as a great writer. I don't have the next three issues of New Funnies. I wonder if he equaled this divine level of absurd humor in those next stories. You can see the Woody stories for issues 90 and 94 HERE and HITHER. 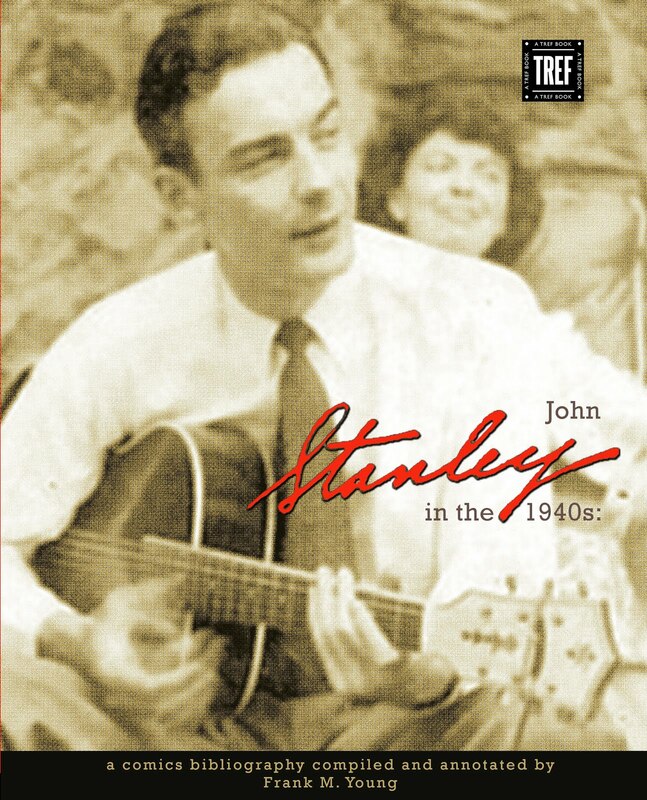 Stanley's depiction of Native Americans here is more akin to a comic opera than to the brassy racism of wartime mainstream America. 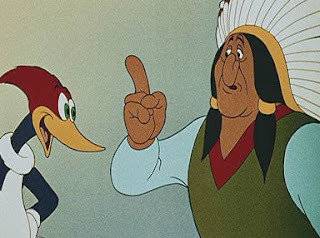 The following stills from Culhane's Barber of Seville show the woodpecker abusing a stereotyped Native American AND a swarthy Italian, in quick succession. 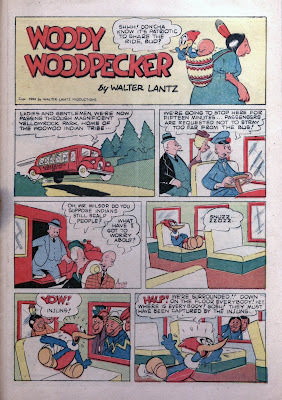 It would take the comic-book version of Woody awhile to catch up to the 1944 re-design of the character. 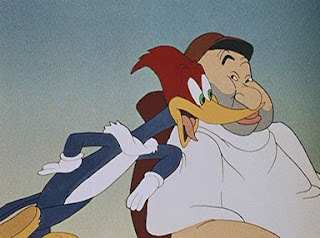 In this first story, Woody still looks like his visually horrid earlier incarnation (seen here in a still from his second, self-titled 1941 carton). All for now. I'm off to immerse myself in the wonderful world of SFIT! If you're in Seattle, come join me!